The living room is the most lived-in spot in your home: it's where you relax, unwind and entertain. But a designing a living room that strikes the balance between spacious and calm, and is packed with enough seating and storage to make the room practical can be tricky to achieve – especially if that living room is small. Fear not, we have a plethora of solutions for your small living room woes. Whether you are designing a living room from scratch or feeling cramped in your current space, our tips and tricks will allow you to expand your square footage without having to knock down any walls. In any small room, each piece of furniture needs to earn its keep, so choose pieces that are multi-purpose. A stool that can be used as an end table, a pouffe that transforms into a storage box, a sofa with secret storage... you get the idea. Ottomans are great for this: top them with a tray and they become a coffee table; strew them with cushions and they're extra seating; buy a bed in a box and you've got a guest space, too! This bed in a box ottoman is from Sofa.com. Living room curtains have their upsides: they add colour, pattern and a feeling of comfort to a room. But if yours are bulky and stealing light from an already compact window, why not swap them for shutters? They let in tons of light, don't take up any space and are easy to co-ordinate around. Plus, DIY-fit options are super affordable. 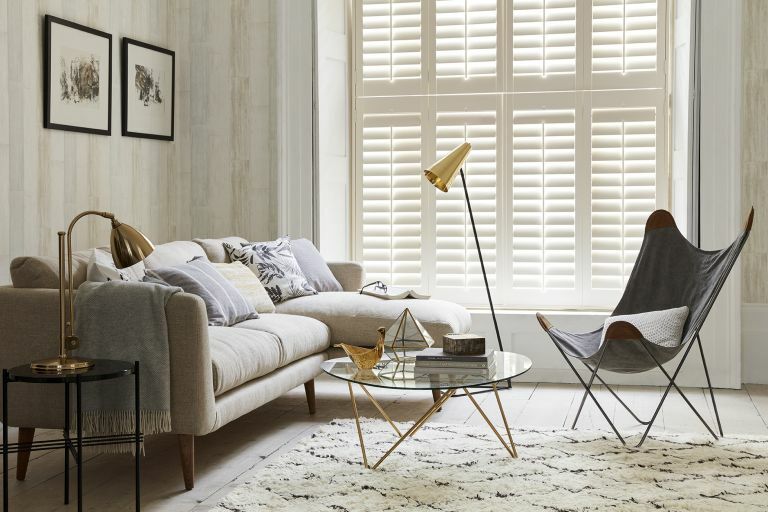 Plantation shutters by California Shutters. Check out more living room window treatment ideas in our guide. Why have one table when you can have two in the same space? A set of nested tables that fits one or two drinks is ideal for creating more surface space when you have guests over. When you are done entertaining you can just slot them neatly away. If you are lacking in square footage but have reasonably high ceilings, you can easily make a room feel bigger by utilising vertical space. This space may not be that useful for adding extra seating but clever living room storage ideas – ladder style shelving, floating shelves or wall mounted magazine racks – will provide extra storage and display space with a minimal footprint. This wall mounted shelving unit from Ikea comes in different depths and widths so you can choose a size to suit your space. Top tip: Choose storage with sliding doors as they don’t take up space when opened. Adding varied light sources at different heights will draw the eye to different areas of the living room, making the space feel more interesting and marking out its various zones. For example, a strategically placed table lamp can turn a dark corner into a cosy reading nook; and an anglepoise lamp can instantly create a work space in your living room. Ensure all your living room lighting is on dimmers, too, so that you can adjust to mood to suit the occasion. Using mirrors to create the illusion of more space and light is the oldest design trick in the book. Placing a large mirror on the adjacent wall to your biggest window will reflect the most light, but if your windows are small or you don’t want to rely on natural light, try placing a tall mirror behind furniture to create the visual trick of another room opening up beyond. Check our more mirror design and display ideas. Another age-old, space-making design trick: swap out dark, bulky furniture for transparent items made from glass or acrylic. Doing so removes visual barriers and opens up a room. Alternatively go for pieces with slim frames to let light flow through the space. There is a common tendency, when designing the layout of a small living room, to shove all your furnishings up against walls. But this attempt to claim back those precious few inches can often have an adverse effect. Instead, pull your furniture away from the wall a tad, creating space around the outside of the room, and group them around a central coffee table. PS. Less furniture is more in a small living room. Think about alternatives to the traditional three piece suite was designing a small living room . We might be automatically drawn to filling our living rooms with large sofas and armchairs, but resisting the temptation and choosing fewer, or less bulky, pieces will make a difference to how large a small living room feels. You can always add cosiness to pared back furniture with plenty of cushions and by layering throws. For more tips on how to choose the best furniture for small living rooms have a read through our guide. Find the best sofas for small living rooms and the best sofa beds for small spaces, too. Top tip: If you simply can’t go without a large sofa, corner sofas are idea for smaller living rooms as they maximise seating in minimal space. Even better, find one like the Tidworth Chaise sofa from Willow & Hall that has added storage. Instead of dotting lots of different types of storage around a room, bite the bullet and invest in one wall of built in storage that fits perfectly in your space. You can then customise your shelving to suit your needs. The Neville Johnson Sudbury Living Concept fitted furniture range works well here because it’s been designed to fit the TV (and all of its ugly wires) as well as leaving plenty of room for decorative pieces. Generally speaking, crisp white walls and minimalist hues make a living room feel more spacious, but having a small space to work with doesn’t need to crush your colour dreams. If you prefer a more vibrant aesthetic over magnolia-blah then run with it. Be inspired to choose the best paint colour for your living room in our dedicated feature. Darker shades can actually disguise the perimeter of a room, making a it feel bigger and – at night – much cosier. If you are designing a north-facing living room, ensure you use our tricks for enhancing the space with mirrors and lighting, and add warmth to the space with richly-grained wood in furniture or flooring, and plenty of accessories in a lighter, sunnier shade. Be inspired by more dark and atmospheric decorating ideas. White floors and ceilings bounce lots of light about and create a bigger, brighter looking space. So why not tackle honey-coloured floorboards with a paintbrush? You'll have a more contemporary, bigger-looking space in hours for no more than the price of a can of paint. Plus, you can always throw down a bright rug to add a splash of colour and a layer of comfort, or use a darker paint colour on your walls than you might have dared to previously. Or, just throw down a light-coloured rug for an instant transformation. This is something you can easily DIY, just check out our step-by-step guide to how to paint floorboards. Before we go on to talk about the many positive points of adding prints and murals to a small living room, can we just appreciate the artful layering in this living room? That's how it's done, people! Anyway, yes, murals – a great way to add even more texture to a small living room. They are also a fab option if you are decorating a rented home, because you can choose to hang a mural rather than paste it permanently to your wall. In this small living room, the use of a mural expands the space as it stops an expanse of white wall making the room feel boxy. For more wall mural ideas, check out our feature.